Ever since I bought myself a spaetzle maker a few months ago, I have been busily at work making oddly flavored spaetzles, from pumpkin spaetzle to acorn spaetzle. Now, to celebrate the coming of spring, here’s my most vivid dumpling yet: Stinging nettle spaetzle. My friend Josh, Holly and I went out to Isleton the other day to pick our annual batch of nettles. I have a whole raft of nettle recipes on this site, and use the vibrant green pretty consistently from February through March. You need to collect nettles when they are still young, otherwise they get too fibrous. For more detailed info, I wrote a primer on collecting nettles a while back. Spaetzle, for those who don’t know, are little dumplings native to the Alpine region between Italy and Austria, although they appear all over Northern Europe. Spaetzle are made with flour, eggs and often milk. Nutmeg is a common ingredient, as are supplemental flavors. Thus the nettles. 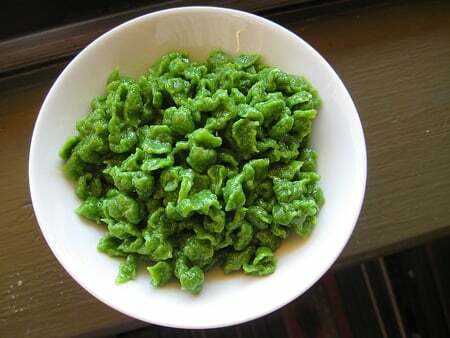 Nettle spaetzle are a shocking, lurid green. Greener than green. Their taste is pretty mild, although you can definitely taste the slight brininess of the nettle. I like to serve these with brown butter, or with mushrooms. I made these spaetzle for a very special dish that I plan on writing about in a few days. Stay tuned. If you don't have nettles, these spaetzle are equally good with blanched spinach, parsley, or oregano. Something green, tender and flavorful. To blanch nettles, boil a large pot of salty water (it should taste like the ocean) and toss 3-5 tong-fulls of freshly washed nettles into it. I say tong-fulls because you will be stung by the nettles if you grab them. Boil the nettles for 2-5 minutes; dwarf nettles need only 2 minutes, regular nettles need 4-5 minutes. Remove the nettles from the boiling water and dunk them into a bowl of ice water to cool. Let them sit there for a minute or so, then wring out as much moisture as you can from them. Now they are ready to use. Bring another large pot of salty water to a boil -- or, if your nettles were nice and clean when you blanched them, you can use the same water, although it will turn brown because the chlorophyll leached from the nettles will overcook. I change the water. Put 1 cup of blanched nettles into a blender with the cup of milk and buzz to combine. Pour this into a bowl and whisk in the eggs. Mix all the dry ingredients in a large bowl, then mix in the wet ingredients. You will get a sticky batter. Put this batter into your spaetzle maker and run it over the boiling water. Allow the dumplings to boil for 1-2 minutes on the surface. You can eat them now, or you can save them for later by shocking the spaetzle in a bowl of ice water and then laying them out on a sheet pan to dry a bit. Coat with a little oil to keep them from sticking together. If you do not have a spaetzle maker, you can use a colander with wide holes, or you can put the batter on a cutting board and flick little pieces off with a knife; this is a country-style spaetzle. Serve your spaetzle with brown butter, a cream sauce, with mushrooms, or really with anything you'd like. Once shocked in cold water and coated with oil, spaetzle will last in the fridge for several days.